Israeli forces have continued with systematic attacks against Palestinian civilians and their property in the occupied Palestinian territories (oPt) for the reporting period of 15 - 21 January 2015. During the reporting period, Israeli forces wounded 6 Palestinian civilians, including a child and woman, while wounded 3 international human rights defenders, including a woman. Eight of these civilians were wounded in the West Bank and the ninth one was wounded in the Gaza Strip. In the Gaza Strip also, Israeli navy forces continued to chase and fire at Palestinian fishing boats. In the West Bank, on 15 January 2015, Palestinian civilian was wounded when Israeli forces moved into Jenin refugee camp, raided a number of houses and arrested 4 members of Hamas. On 20 January 2015, a 34-year-old woman sustained a bullet wound to the face when Israeli forces moved into al-'Eisawiya village, north of East Jerusalem. In the same context, Israeli forces continued to use excessive forces against peaceful protests against the construction of the annexation wall and settlement activities. As a result, a Palestinian civilian and 3 international human rights defenders were wounded. Moreover, another Palestinian civilian and a Spanish human rights activist were arrested. Additionally, 2 Palestinian civilians, including a child, were wounded during a protest organized in front of Ofer detention facility, southwest of Ramallah, against Israeli attacks on Palestinian civilians and their property, especially in East Jerusalem. In the Gaza Strip, on 16 January 2015, Israeli forces opened fire at a group of Palestinian youngsters, east of Jabalia in the north of the Gaza Strip, 50 meters away from the border fence. As a result, a 20-year-old civilian sustained a bullet wound to the right and left legs. In the context of targeting Palestinian fishermen in the Gaza Strip sea, Israeli navy forces opened fire at Palestinian fishing boats 4 times on 17, 18, 20 and 21 January 2015, but no casualties were reported. During the reporting period, Israeli forces conducted at least 69 military incursions into Palestinian communities in the West Bank. During these incursions, Israeli forces arrested at least 76 Palestinians, including 10 children and 3 women. Nineteen of these Palestinians, including 5 children and the 3 women, were arrested in Jerusalem. The detainees included and editor at Hona al-Quds network, from Beitounia village, west of Ramallah, and a reporter of al-Aqsa satellite channel, from Hebron. On 19 January 2015, Israeli forces demolished an under-construction house in al-Eisawiya village, north of East Jerusalem, without prior notice. On 21 January 2015, Israeli forces demolished a house in al-Sal'a neighbourhood, in Jabal al-Mukaber village, southeast of East Jerusalem, under the pretext of not obtaining a construction license. On the same day, bulldozers belonging to the Israeli municipality demolished a building comprised of 4 apartments in Shu'fat neighbourhood, north of East Jerusalem, under the pretext of not obtaining a construction license. On 19 January 2015, Israeli forces closed 2 houses in al-Shuhada Street, in the center of Hebron, upon a military order. Israeli forces claimed that a Palestinian young man used the 2 houses to throw Molotov cocktails at a military site, 50 meters away from the 2 houses. On the same day, Israeli forces demolished a water well under the pretext of not obtaining a license in area (C), south of Halhoul, north of Hebron. They also seized metal poles and tin-made boards in Khellet al-Warda, east of Hebron. On 20 January 2015, Israeli forces moved into al-Refa'iya area, east of Yatta, south of Hebron. They evacuated 2 houses to be demolished under the pretext of not obtaining construction license. In addition, they demolished a storehouse, barrack, a residential tent and a toilet. On 15 January 2015, a group of settlers levelled an agricultural land in Khellet al-Nahla, south of Bethlehem to establish a settlement road for a settlement outpost. During the reporting period, Israeli soldiers used excessive force against peaceful demonstrations organized by Palestinian civilians, international and Israeli human rights defenders in protest at the construction of the annexation wall and settlement activities in the West Bank. As a result, a Palestinian civilian and 3 international human rights defenders were wounded. In the same context, 2 civilians, including a child, were wounded during 2 peaceful protests in the vicinity of Ofer detention facility, southwest of Ramallah, in protest at Israeli attacks against Palestinian civilians and their property, especially in East Jerusalem. On 16 January 2015, a 17-year-old child sustained a bullet wound to the left leg while on 20 January 2015, a 19-year-old civilian sustained a bullet wound to the right eyebrow. Following the Friday prayer, on 16 January 2015, dozens of Palestinian civilians and international and Israeli human rights defenders organized a peaceful demonstration in Bil’in, west of Ramallah, in protest at the construction of the annexation wall and settlement activities. The demonstrators took the streets raising the Palestinian flags and headed to the liberated territories near the annexation wall. Early in the morning, Israeli forces closed all entrances to the city to prevent Palestinian civilians and international and Israeli human rights defenders from participating in the protests. Protestors marched by the annexation wall and tried to cross the fence. Israeli soldiers stationed behind the wall, in the western area, and a large number of soldiers deployed along it, fired live bullets, tear gas canisters, rubber-coated steel bullets, sound bombs and wastewater at them and chased them into the olive fields. As a result, a 55-year-old Mexican solidarity activist was hit by a gas canister to the back of the neck and a 32-year-old Israeli solidarity activist was hit by a gas canister to the belly. In addition, Israeli forces arrested a 40-year-old Spanish solidarity activist. Around the same time and despite the cold weather, dozens of Palestinian civilians organised a peaceful demonstration in the centre of Ni’lin village, west of Ramallah, in protest at the construction of the annexation wall and settlement activities. The demonstrators took the streets and headed to the annexation wall. Israeli forces closed the gates of the wall with barbwires and prevented the demonstrators from crossing to the land behind it before they responded by throwing stones. Israeli soldiers fired live ammunition, rubber-coated metal bullets, sound bombs and tear gas canisters at the civilians, and chased them into the village. As a result, a number of demonstrators suffered tear gas inhalation and others sustained bruises as they were beaten up. Also following the Friday prayer, Palestinian civilians and international solidarity activists organized a protest in the center of Kufor Qaddoum village, northeast of Qalqilya, heading to the eastern entrance of the village in protest against closing that entrance since the beginning of al-Aqsa Intifada with an iron gate. The demonstrators threw stones at Israeli soldiers, who fired sound bombs and tear gas canisters in response. Eyewitnesses said that Israeli forces unprecedentedly fired around 700 tear gas canisters and sound bombs within 15 minutes. As a result, a 22-year-old Palestinian civilian was hit by a gas canister to the right hand and a 33-year-old French solidarity activist, whose name is Dounia, sustained a bullet wound to the left leg. She was admitted to the hospital immediately. Moreover, Israeli forces ambushed the civilians and chased them to arrest them. As a result, 5 civilians were wounded. 5. 47-year-old Abdullah Mousa Ali sustained fractures in the nose and hand as he was hit by gun butts, anfhe e was taken to Rafidiya Hospital to receive medical treatment; Israeli forces also arrested and attacked 48-year-old Maher Saleh Hassan, a Palestinian Police officer, and released him at approximately 14:25. At approximately 10:00 on Saturday, 17 January 2015, Palestinian civilians, international solidarity activists, popular committees and residents of Sourif village, northwest of Hebron, gathered to organize a protest against settlement activities and the annexation wall and claim reopening the road between the village and al-Jaba'a village that has been closed for 10 years. The demonstrators made their way to the closed road and raised Palestinian flags. Israeli soldiers deployed in the area stopped the demonstrators and fired tear gas canisters and sound bombs. They also sprayed pepper gas and tried to arrest and attack some demonstrators. As a result, a number of demonstrators suffered tear gas inhalation and other sustained bruises as they were beaten up by Israeli soldiers. Also following the Friday prayer, on 16 January 2015, dozens of youngsters gathered from different areas of Ramallah and al-Bireh near Ofer detention facility, southwest of Ramallah. They headed towards the facility’s gate that was closed by Israeli soldiers. They set fire to tires and threw stones and empty bottles at the soldiers. Israeli forces deployed around the detention facility and started firing live and rubber-coated metal bullets, sound bombs and tear gas canisters. As a result, a 17-year-old child sustained a bullet wound to the left leg and was then taken to Palestine Medical Compound in Ramallah. On Tuesday afternoon, 20 January 2015, dozens of youngsters gathered from different areas of Ramallah and al-Bireh near Ofer detention facility, southwest of Ramallah. They headed towards the facility’s gate that was closed by Israeli soldiers. They set fire to tires and threw stones and empty bottles at the soldiers. Israeli forces deployed around the detention facility and started firing live and rubber-coated metal bullets, sound bombs and tear gas canisters. As a result, a 19-year-old civilian sustained a bullet wound to the right eyebrow and was then taken to Palestine Medical Compound in Ramallah. He received first aid there and was transferred to Musallam Hospital in al-'Ersal neighborhood in Ramallah, where he underwent an operation. It was found out that the retina was hurt. · Hebron: Israeli forces have continued to impose severe restrictions on the movement of Palestinian civilians. At approximately 07:30 on Thursday, 15 January 2015, Israeli forces established a checkpoint at the entrance of Deir Samet village, west of Doura, southwest of the city. Later, the checkpoint was removed and no arrests were reported. At approximately 07:30 on Saturday, 17 January 2015, Israeli forces established a checkpoint at the entrance of Beit Kahel village, northwest of the city. At approximately 16:00, Israeli forces established a checkpoint at the northern entrance of Yatta, south of the city. Later, both checkpoints were removed and no arrests were reported. At approximately 08:00 on Sunday, 18 January 2015, Israeli forces established a checkpoint at the entrance of al-‘Arroub refugee camp, north of Hebron. Later, the checkpoint was removed and no arrests were reported. At approximately 16:00 on Monday, 19 January 2014, Israeli forces established a checkpoint at the entrance of Ezna village, west of Hwbron. While civilians were trying to pass on feet via the checkpoint, the israeli soldiers fired sound bombs at them, but no injuries were reported. Later, the checkpoint was removed and no arrests were reported. At approximately 07:00 on Tuesday, 20 January 2015, Israeli forces established a checkpoint at the entrance of al-Syoukh village, east of the city. At approximately 16:30, Israeli forces established a checkpoint at the northern entrance of Hebron. At approximately 17:00, Israeli forces established a checkpoint at the entrance of Kherbet al-Jalajel area, east of the city. Later, the checkpoints were removed and no arrests were reported. At approximately 08:00 on Wednesday, 21 January 2015, Israeli forces established a checkpoint at the entrance of al-Samou'a village, south of the city. At approximately 17:00, Israeli forces established a checkpoint at northern entrance of Hebron. Later, both checkpoints were removed and no arrests were reported. · Ramallah: Israeli forces have continued to impose severe restrictions on the movement of Palestinian civilians. At approximately 08:30 on Thursday, 15 January 2015, Israeli forces closed the entrance of ‘Aboud village, northwest of Ramallah with sand bags and stones. As a result, severe traffic jams occurred and the residents had to take alternative routes. In the meantime, Israeli forces established a checkpoint at the entrance of Deir Abu Mas’al village, northwest of the city. While at approximately 20:30, Israeli forces established a checkpoint on the road between Termisia and al-Mughir, north of the city. Both checkpoints were removed and no arrests were reported. At approximately 10:00 on Friday, 16 January 2015, Israeli forces established two checkpoints: one at the entrance of Nabi SAleh village, and the other under Yabroud Bridge. At approximately 12:30, Israeli forces established a similar checkpoint at the entrance of Nil’in village, west of Ramallah. All checkpoints were removed and no arrests were reported. At approximately 14:30 on Saturday, 17 January 2015, Israeli forces established a checkpoint under Kharabtha al-Misbah Bridge, southwest of the city. Later, the checkpoint was removed and no arrests were reported. At approximately 19:30, Israeli forces reestablished their existence at ‘Attarah checkpoint on the northern entrance of Bir Zeit, north of Ramallah. Later, all checkpoints were removed and no arrests were reported. At approximately 09:30 on Monday, 19 January 2014, Israeli forces established 2 checkpoints at the entrance of 'Aboud village and the entrance of Deir Abu Mash'al village, northwest of Ramallah. At approximately 13:00, they established another checkpoint under the bridge of Yabrud village, northeast of Ramallah. At approximately 20:30, they established a similar checkpoint at the entrance of Termes'ayah, north of the city. Later, all checkpoints were removed and no arrests were reported. · Jericho: Israeli forces have continued to impose severe restrictions on the movement of Palestinian civilians. At approximately 10:30 on Monday, 19 January 2014, Israeli forces established a checkpoint at the entrance of Fasayel village, north of Jericho. At approximately 19:00, they established a checkpoint near the southern entrance of the city. Later, both checkpoints were removed, and no arrest were reported. · Qalqilya: Israeli forces have continued to impose severe restrictions on the movement of Palestinian civilians. At approximately 12:30 on Thursday, 15 January 2015, Israeli forces established a checkpoint at the entrance of Seer village, northeast of the city. At approximately 22:10, they established another at the entrance of ‘Azzoun village, east of the city. Both checkpoints were removed and no arrests were reported. At approximately 00:20 on Friday, 16 January 2015, Israeli forces established a checkpoint at the eastern entrance of the city. At approximately 10:40, they established a similar checkpoint at the entrance of Jious village and another one at the entrance of Kufu Jammal, east of the city. At approximately 11:10, they established a similar one at the entrance of Amatin village. At approximately 22:20, they established another one at the eastern entrance of the city. All checkpoints were removed and no arrests were reported. At approximately 08:30 on Sunday, 18 January 2015, Israeli forces established a checkpoint at the entrance of Izbat al-Tabib village, east of the city. At approximately 17:00, another checkpoint was established at the entrance of Amatin, northeast of the city. At approximately 20:45, they established a similar one at the eastern entrance of the city. All checkpoints were removed and no arrests were reported. At approximately 09:00 on Monday, 19 January 2014, Israeli forces established a checkpoint at the entrance of 'Azoun village, east of the city, and re-established it at approximately 20:45. At approximately 18:45, another checkpoint was established between the villages of Jayous and KAfr Jamal, northeast of the city. All checkpoints were removed and no arrests were reported. · Tulkarm: Israeli forces have continued to impose severe restrictions on the movement of Palestinian civilians. At approximately 08:30 on Thursday, 15 January 2015, Israeli forces stationed ‘Annab military checkpoint which is established on the road between Tulkarm and Nablus, east of the city, tightened their restriction against civilians and obstructed their movement. Later that day, the tightening ended and no arrests were reported. The tightening renewed on Friday and Saturday. They re-tightened their restrictions on 11:00 on Friday, 16 January 2015, and at approximately 18:00 on Saturday, 17 January 2014, in addition to at approximately 09:00 on Sunday, 18 January 2014, and at approximately 09:00 on Monday, 19 January 2014. · Jenin: Israeli forces have continued to impose severe restrictions on the movement of Palestinian civilians. At approximately 12:30, Israeli forces closed Barta'ah checkpoint which is established at the entrance of Eastern Barta'ah village that is isolated from its surroundings due to the annexation wall, southwest of Jenin, for no reasons. Israeli soldiers later re-opened the checkpoint. It should be mentioned that this checkpoint is the sole path for the village residents to the outside world and when it is closed, the village turns into a big prison. · Salfit: Israeli forces have continued to impose severe restrictions on the movement of Palestinian civilians. At approximately 06:40 on Wednesday, 21 January 2014, Israeli forces established a checkpoint at the entrance of Deiristiya, northwest of Salfit and prevented civilians from entering or leaving the village but only on their feet. · At approximately 22:00 on Friday, 16 January 2015, Israeli forces stationed at al-Jalama crossing between Jenin and Israel closed the border crossing while the soldiers arrested Natiq Hussam Hussni Hantoul (25) who was near the crossing and took him to an unknown destination. It should be noted that according to PCHR’s archives, Hantoul was arrested on 22 February 2012 after clashes erupted between Palestinian youths and Israeli soldiers in solidarity with the detainees at the time. He was also arrested on 26 May 2013 on a checkpoint which was established at the intersection of ‘Arraba, north of Jenin. · At approximately 13:20 on Monday, 19 January 2014, Israeli forces arrested Naser Ibrahim Thiab (22) from 'Azoun village, east of Qalqilya while they were near al-Nabi Elias village and taken to an unknown destination. · At approximately 10:00 on Wednesday, 21 January 2014, Israeli forces stationed at "Gosh Etzion" settlement, south of Bethlehem, arrested Qassam Ahmed Abu Mariah (21) when he was summoned by the Israeli intelligence and was taken to an unknown destination. "At approximately 12:30 on Monday, 19 January 2014, I went with my brother Wad'ia (16) and other five friends to play in an area near the house on a hill in al-'Aroub refugee camp, north of Hebron. We stayed there until at approximately 15:00 when we were surprised by a number of Israeli soldiers carrying weapons. One of them took a piece of paper out of his pocket and started calling our names. They beat us up with their hands and feet. Around 10 minutes later, they ordered my 5 friends to evacuate the area and when they did, the Israeli soldiers pushed Wadi'a and hit him with the gun butts. They then pushed me on a rock, so my head was hit and bleeding. The Israeli soldiers then took us to Beit Fajjar village, and I felt very tired walking as the distance was so far. An Israeli soldier then grabbed me from the shirt and dragged me behind him. When we arrived at a gas station at the entrance of the village, an Israeli patrol came and took my brother to Beit Fajjar village. Meanwhile, the other Israeli soldiers followed them and left me alone. I asked one of the workers in the station to drive me to a shop belonging to my relative in Beit Fajjar village. My relative then took me by an ambulance to Hebon Governmental Hospital, where I underwent medical examinations and received the necessary medical treatment. They found that I sustained bruises in the right wrist and my left foot in addition to an injury in my head. We later knew that my brother is detained in the detention centre of "Gosh 'Eztion". · At approximately 16:00 on Tuesday, 20 January 2015, Israeli forces moved into al-'Isawiyah village, north of East Jerusalem. They stationed at the northern entrance of the village and established a checkpoint in the area. Dozens of Palestinian civilians gathered to throw stones at the Israeli soldiers, who in response fired rubber-coated metal bullets and sound bombs. As a result, Iman Khalil Abu 'Asab (34) was hit by a bullet to the face and was taken to Hadasa Hospital to receive medical treatment. · On Monday dawn, 19 January 2014, the Israeli municipality in Jerusaelm bulldozed an under-construction house belonging to Usamah Rebhi Dari in al-'Isawiyah village, north of Eastern Occupied Jerusalem. Mohammed Abu al-Hummus, Member of the Follow-up Committee in al-Isawiyah village said to a PCHR fieldworker that at approximately 04:00 on the aforementioned day Israeli soldiers accompanied by 3 bulldozers and employers from the Israeli Municipality moved into al-'Issawiyah village, north of East Jerusalem. They surrounded the aforementioned 200-square-meter house and immediately bulldozed it completely. Abu al-Hummus said that the house was demolished without any prior warning. He added that Dari started building the house 10 months ago, but the Israeli Municipality prevented him under the pretext of non-licensed construction. 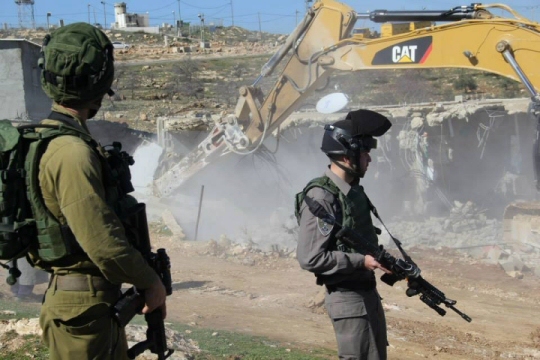 · At approximately 09:00 on Wednesday, 21 January 2014, Israeli bulldozers from the Israeli municipality demolished a house belonging to 'Elian Rabay'ah in al-Sal'ah neighborhood in Jabal al-Mokaber village, southeast of East Jerusalem under the pretext of not obtaining license. Rabay'ah said to a PCHR fieldworker that the Israeli Municipality staff raided his house many times, the last of which was on Monday, 19 January 2014, when they handed him a decision to demolish his house. He added that he attempted to delay the decision, but he could not. The municipality bulldozers then came on the aforementioned day and demolished his house, which cost him more than 100,000 NIS. · At approximately 11:00 on the aforementioned day, the Israeli municipality bulldozers demolished a residential building in Sho'afat neighborhood, north of Eastern Jerusalem, under the pretext of obtaining no license. The building is comprised of 4 apartments belonging to the families of al-Mashni, Besharah and Mkheimar. Walid Besharah, an owner of one of the destroyed apartments, said to a PCHR fieldworker that the building which the Israeli bulldozers destroyed was ready to be resided one and half a year ago, but the Municipality prevented them and forced them to close it until they can obtain a construction license in order not to demolish it. He added that he and the other 3 owners tried to obtain construction licenses from the competent authorities, and the municipality initially agreed on building in the area. However, the court issued consecutive decisions to destroy the building, the last of which was last week. Besharah said that the 120-square-meter building which is comprised of 4 apartments cost more than US$ 500,000. Moreover, each owner lost around US$ 40,000 in order to obtain construction licenses and delay the construction orders during the last period. · At approximately 02:00 on Thursday, 15 January 2014, Israeli forces moved into al-'Izariyah village, east of East Jerusalem. They raided and searched a number of houses and arrested Mohammed Ramzi Abu Roumi (23) and Mohammed Anis Dweik and took them to an unknown destination. · At approximately 13:00 on the same day, Israeli forces moved into al-Tour neighborhood, east of the Old City in East Jerusalem. They stationed on the main street near the schools of "al-Tour Elementary for Boys" and "al-Shamlah". They fired sound bombs and tear gas canisters at the students when they were on their way out. They also arrested Amjad al-shami (48), a member of the parents Committee. · At approximately 20:00 on Friday, 16 January 2014, israeli forces arrested As'ad Waqqas Dahdoul (24) after setting him an ambush in " Ras Kabsah" area in al-'Izariyah village, east of East Jerusalem, and took him to an unknown destination. · At approximately 05:00 on Monday, 19 January 2014, Israeli forces moved into Jabal al-Mokaber village, south of East Jerusalem. They raided and searched a number of houses, from which they arrested 'Abdullah 'Ali Abu Kaf (25), Mohammed Mousa 'Amirah (21) and his brother Ahmed (19). · At approximately 11:00, Israeli forces arrested 5 Palestinian females, including 2 children, who prevented a number of Israeli settlers from raiding the roof of the Dome of the Rock in al-Aqsa Mosque in the Old City and took them to "al-Qashlah"CCentre in the Old City to question them. The Israeli Police accused them of violating the freedom of access to a holy place and carrying out deeds that affect the public security. The arrested women were identified as: Hebah al-Husseini (28); Safaa' Sayyaj (26); Joman Abu 'Arafah (23); Bar'aah al-Natshah (17) and Ansam Moghrabi (17). · At approximately 13:30, Israeli forces arrested Ahmed Ibrahim Abu Gom'ah (11) while leaving his school in al-Tour neighborhood, east of East Jerusalem and took him to an unknown destination. · At approximately 16:00, Israeli forces harshly hit Mohamme Jamal Ghaith (16) on his head and face and arrested him while being present in front of his house in Selwan village, south of East Jerusalem. Due to his injury to the head, he was taken to Hadasa Hospital. · At approximately 05:00 on Tuesday, 20 January 2015, Israeli forces moved into Bab Hettah neighborhood in East Jerusalem. They raided and searched a number of houses, from which they arrested Hamdan Bahaa' Jaber (21). · At approximately 09:00 on the same day, Israeli forces arrested Ahmed Yasser Zomurd (24) when they moved into al-'Issawiyah village, north of East Jerusalem. They beat him and took him to an unknown destination. · At approximately 05:00 on Wednesday, 21 January 2015, Israeli forces moved into 'Ein al-Lozah neighborhood in Selwan village, south of East Jerusalem. They raided and searched a number of houses from which they arrested 3 civilians, including a child: Mousa Mohammed 'Odah (17); Naji Mohammed 'Odah (19) and Ziyad Ahmd al-Qaq (19). · At approximately 09:00 on Monday, 19 January 2015, the Israeli Engineering Department closed 2 houses in al-Shuhada Street, which has been closed since 2000, in the center of Hebron, with welding upon a military order. Israeli forces claimed that a Palestinian youngster used the 2 houses to throw Molotov cocktails at a military site, 50 meters away from the 2 houses. The 2 houses, 50-square-meters each, belong to Zahira Abdul Aziz Dandees (80). 15 days earlier, it was found out that settlers made holes through the houses' walls and seized them under the protection of Israeli forces. · At approximately 10:00 on the same day, Israeli forces backed by a vehicle belonging to the Israeli Civil Administration, a bulldozer and a digger, moved into al-Kamb area, south of Halhoul north of Hebron. They demolished a water well belonging to As'ad Sa'id al-Ja'bari (63) under the pretext of not obtaining a license in area (C). · At approximately 14:00, Israeli forces accompanied by a vehicle belonging to the Israeli Civil Administration moved into Khellet al-Warda area, east of Hebron. They deployed in the area and confiscated metal poles and tin-made boards belonging to Mahmoud Mohammed al-Ja'bari (47) and his brothers under the pretext they were in area (C). Moreover, a Civil Administration officer informed the abovementioned person and his brothers to demolish the barrack they started to build within 3 days, otherwise he would return, demolish it and confiscate its contents. It should be noted that Israeli forces had demolished 4 barracks belonging to the same person and his brothers on 01 May 2012. · At approximately 08:00 on Tuesday, 20 January 2015, Israeli forces moved into al-Refa'iya area, east of Yatta, south of Hebron. They prevented residents of the area from approaching and started evacuating 2 houses to be demolished, as they were built without a license according to the Israeli claims. · At approximately 11:00 on Thursday, 15 January 2015, a group of settlers levelled a tract of land in Khellet al-Nahla near "Afrat" settlement, south of Bethlehem, belonging to Mohammed Yehya Ayash. It should be noted that the settlers did so in order to establish a settlement road to establish a settlement outpost in the same place. The settlers also set up a big tent in the same place in 2013 for that purpose. Full, detailed document, including info on patrols and border crossings available at the official PCHR website.